I got two surprises in the mail this week. 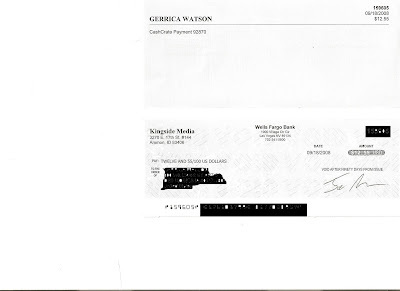 Clickbank and Cash Crate decided to send me a check. They aren't much, but I'll use them for web hosting, domains, and other related expenses. I don't think I've spent even half an hour working between both sites in the past three months. Despite this, Clickbank still brings in cash. I had forgotten about both of them due to other things demanding my attention these days. This was just the kick in the arse that I needed. So far I have created one wordpress blog, generated various keyword lists for future projects, gracefully bowed out of freelance writing work, and sincerely plan to make internet marketing my sole income before the year's end. I also have a few E-reports planned. 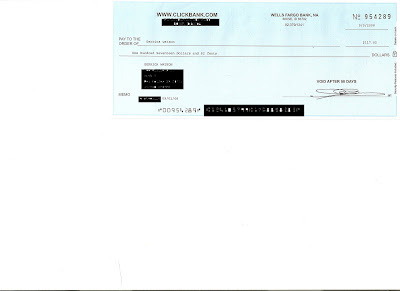 Many have asked, so I think I might create a few reports detailing how I manage to get Clickbank and Cash Crate checks completely EFFORTLESSLY. All work and no play makes me a very depressed person, so I'm definitely planning to do some things that I enjoy. For example, a novel writing contest is held every November. I usually watch in awe as writers make their dream of becoming a published fiction author a reality. Not this year! I'm gonna be right in the thick of things! It'll probably be challenging to complete that goal between work and studies, but I guess that's why they it call it a "Writing Challenge." If you use your email frequently, you might as well get paid for it! We Pay Mail is a PTR (paid-to-read) program that's been around for a couple of years. They pay up super-fast and have a low pay-out of $5.00. Is The Ebook Movement Suffering Because of Sub Par Writers? That's a mild offense compared to an ebook I read that was written completely omitting commas some periods syntax and basic structure had missssspellings und was ver dffcut to red. I had no idea where one thought ended and another began. Are your eyes sore yet? That nagging little editor in me wants to lash out at someone! My concern is this: are these "average Joe" writers having a negative impact on the ebook movement? I read a blog post that said, "most ebooks are crap." I don't know if they were talking about ebook content or ebook writers specifically. Since I'm in the process of finishing my ebook, this concerned me. The sad truth is this: not every person is a writer. Sounds rather uncomplicated, right? It seems that people who long to communicate their thoughts also long to communicate via the written word. This is understandable, but can be an ugly situation. You don't have to be the Shakespeare of the Internet. I'm only saying that a little high school English review goes a long way. Being conversational is fine; being grammatically lazy is not fine.